Karen Cota, the principal broker of At Home Real Estate, feels well-equipped to help her clients because she’s lived through the tough times herself. She and her family had built their dream home on five acres in the Coburg Hills near Eugene when the bottom dropped out of the housing market in 2009. When she had to sell the home, it was devastating but she feels the lessons learned have made her a stronger broker. 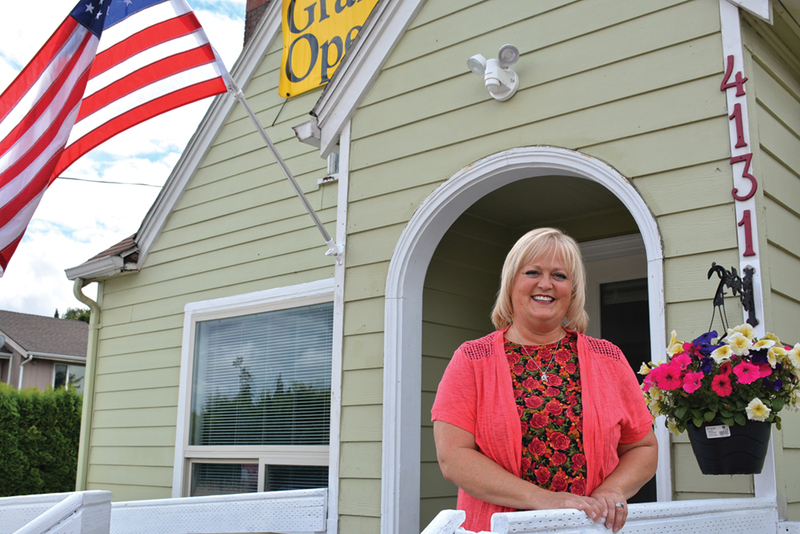 “The things I have gone through have helped me ask the hard questions on everything from owning properties to managing rentals,” said Cota, who opened her new office at 4131 River Road North in May. Even through the tough times, Cota maintained her membership in the local Multimillion Dollar Club for brokers with more than $1 million in sales annually. As much as she’s interested in her clients’ immediate needs and desires, she wants to be able to place a home purchase in a larger picture of what her clients hope to accomplish. Now in Keizer, Cota is looking for new clients with homes to sell, buyers looking for a new place to call home and even property management opportunities. She would also like to bring additional brokers into the At Home fold. “I like helping people succeed, whether it’s someone buying their first home or a broker in their first year. That gives me energy,” Cota said. For an appointment, call 503-990-6600. Officer Martin Powell of the Keizer Police Department (KPD) can tell a lot about you just by looking into your eyes. He’s particularly adept at determining whether you are or have recently been under the influence of an intoxicant or drug. Not only that, he could tell you what classification of drug you ingested with an accuracy rate of better than 80 percent. For instance, he might ask you to follow his finger with your eyes as he traces a line across your field of vision. A sober person could do so with ease, but certain intoxicants will cause pupils to stutter – like when you turn on the windshield wipers on a dry day – a “nystagmus” in his terminology. Those are just a few of the more than 200 clues he can use to make his assessments, and he is very good at it. He’s kept up his 80 percent accuracy rate for five years running in addition to racking up a number of DUII arrests and training his fellow officers in-house and at other agencies. It was those combined efforts that led KPD Sgt. David LeDay to nominate Powell for the Kenneth Snook Drug Recognition Expert (DRE) Award of Excellence. Powell was selected as the winner by the award committee last week. “You have to be above and beyond the average officer for the DRE field and you have to go above and beyond that to be worthy of this award, but that is Martin. He does this for no extra pay or extra incentive than what he gets out of it,” LeDay said. Powell is only the seventh officer to receive the award since its inception in 2010, but he’s now joined the ranks of the very same people who trained him in drug recognition techniques. “Those people on that list (of award winners) were the ones that instructed me and they know the material inside and out as far as teaching. It was humbling to even be considered for that list, much less have my name on it,” Powell said. 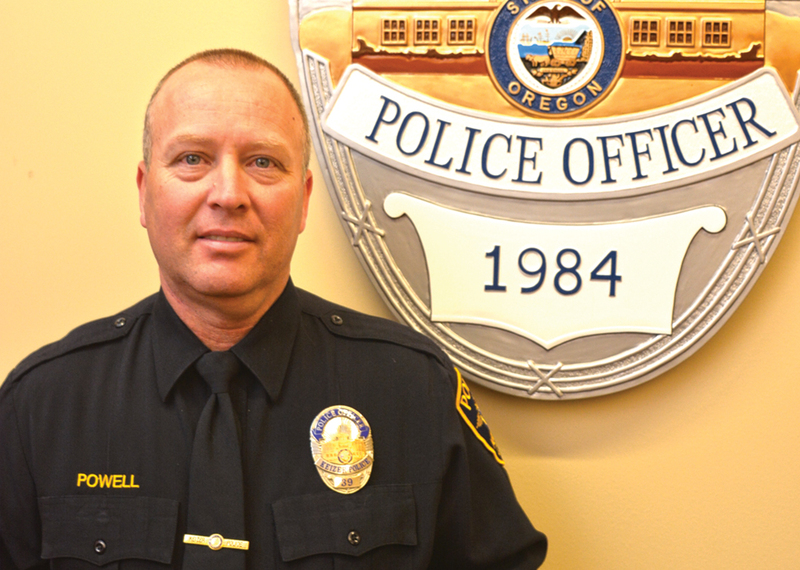 Powell started as a reserve officer with Polk County in 2002 and caught the DUII-recognition bug from his fellow officers. “I learned their passion. The reason I liked it is it’s an opportunity to prevent crime, it’s proactive,” Powell said. LeDay equates a DUII arrest to stopping a homicide in progress. Not every instance of driving under the influence ends in a fatality, but the ones stopped before reaching that point can save lives. Powell had to undergo a rigorous selection process to qualify for DRE classes and then had to complete the classes themselves before being certified five years ago. While drunk driving can be assessed with the assistance of technology, Powell’s DRE skills are brought into play when a breath test yields negative results. When that happens, Powell is brought in for an assessment that covers everything from basic physiology, like pulse rate, to behavior to recent history. In the best cases, he can help divert someone from their trajectory into rehab or open up a single arrest into a larger investigation into the production or delivery of controlled substances. “I get letters from people I arrested that thanked me for doing it. They know it was terrible at the time, but they’ve changed their life or helped others after getting clean or sober,” Powell said. Powell doesn’t come out and say it, but he takes a lot of pride in his work and seeks out arrests – DUIIs – that other officers are less comfortable with because of the amount of work they entail and the scrutiny that follows in court. “There is no purpose for a DUII. Most people have the ability to take a taxi or walk. They just don’t think anything bad is ever going to happen to them. We hope to curb that behavior in others with the arrests we make,” Powell said.